Last-for-now or maybe forever, sourdough workshop! The June workshop dates are Friday, June 15th, 7pm – 8.30pm and Sat. June 16th, 8.30am – 10am. You must come to both sessions. $55. To read about my sourdough workshops, click here. For bookings of the June workshop click here. To book, add your EMAIL (NOT your name, even if I know you) to the booking sheet link now. Payment and course details will then be emailed to you. This is a fun and informative workshop for anyone wanting to make easy, foolproof, nutritious, delicious sourdough bread with fresh, organic, Australian ingredients. Below are some snippets from my February newsletter. To read the full newsletter and see the photos, click here. Happy 2018 I have had a wonderful break, relaxing for nearly 3 weeks at my rusty, quaint, fabulous, old beach shack at Balgowan, on the Yorke Peninsula in S.A. Check out some of my holiday photos below…. Now I am back and ready for a new year of nourishing you all with freshly milled, organic wholefoods and ingredients sourced directly by me from farmers and millers in Tasmania and Australia. 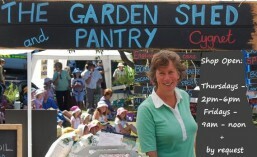 I very much look forward to welcoming you again to my home shop and Cygnet Market stall. Opening times are on the photo at the top of this newsletter. March Sourdough and Cultured Butter Workshop Come to my kitchen and make with me the simplest and best bread for your body and taste buds. Learn about a range of grains and why they must be freshly milled. Create a batch of cultured butter to take home. I offer plenty of tastings and answer all your questions. Read more below…. Pat and Lina’s Olives Not every wholefoods shop owner takes time off from her holiday, on a day of 45C, to visit the olive grower and pick up buckets of olives so that their customers will not miss out at the first market of the year! Read more below…. Shani’s Kitchen Crafts; can you help? Shani helps me at the first market of each month and for some time she has been making fantastic pot holders (which always sell out), using the back pockets of jeans and recycled fabrics but she has run out of pockets! If you have some old jeans and could cut off the legs (which she doesn’t need) and just bring the tops, including the back pockets, that would be fabulous. Please bring to the market or leave on my front verandah. For every 3 pairs you donate at the market, Shani will give you one of her beautiful, hand made soaps. Nutrient Dense? It seems to be the latest catch-phrase … nutrient dense…. but what is it and does it matter? Read more below…. Hugh’s lamingtons and lemon tarts Again you would be best to be to the market early to get some of Hugh’s very popular lamingtons and lemon tarts at my stall. I have not have any since before Christmas and cannot wait!! Viewing this newsletter If you do not see the full 2 columns of this newsletter, then please click “view this email in your browser” below the main photo. Some email servers clip either one column or some of both columns. Square eftpos The Garden Shed and Pantry now has credit card, debit card, chip and contactless payment facilities! Square is a simple and cheap system suited to every form of transaction. It may be cheap but it is not free, so I would still prefer cash but no longer will there be any inconvenience if you do not have enough cash with you! The September workshop date is Friday, September 22nd, 7.30pm – 9pm and Sat. September 23rd, 8.30am – 10am. You must come to both sessions. $55. For bookings of the September workshop click here. To book, add your EMAIL (NOT your name, even if I know you) to the booking sheet link now. Payment and course details will then be emailed to you. On Saturday June 24th, I am doing a 2 HOUR SOURDOUGH WORKSHOP which will be a condensed version of my regular, 2 part workshop. $30. For bookings click here. Add your email address to the list and I will be in touch. This worked very well for a recent U3A group I ran it for recently. You will see all the stages of easy, foolproof, nutritious, delicious sourdough bread and cultured butter and go home with the confidence to start making your own. Also, on the day, there will be 10% off all products in my home shop! Read about my regular sourdough workshops here. Posted in Sourdough, Sourdough Breadmaking, Workshops. Below you will find an excerpt from my May newsletter. To read the whole thing, including some new recipes, please click here. It is fun and fabulous! Everyone, including me, has been waiting for news on Richard’s fantastic Johnston and Somerton almonds, grown in the almond district, Willunga, south of Adelaide. I spoke to Richard on Tuesday. He told me there was a fabulous crop this year and he will be sending them sometime in June! Yippee! Recently I came across an Australia and NZ group of people as keen as I am to share garden produce and, in fact, anything edible or related to food. So, I joined the group and made us a sub-group and website Crop Swap Cygnet and Surrounds. There are several others in Tasmania too. Please join the Crop Swap Cygnet and Surrounds facebook page for updates etc. If you would like to help me make this work, please contact me asap. I am really keen to get started! No money is involved at all. Whether you are a backyard gardener, home cook, forager, seedsaver, cuttings guru, pickle maker or bread baker, you are welcome. Kevin and Cindy’s fabulous, new season’s organic, sundried fruits were supposed to be arriving this week but the silly freight people have not picked them up….. so it will now be the first June market before they arrive. Oh lalalalala, how do businesses survive that are run so badly? The Qld floods inundated the Lismore freight depot but now they are up and running again. I am pleased to say that Slater Farms’ magnificent, fragrant, bio-dynamic, long grain rice did not get flooded and will be at the market, along with rain-fed medium grain rice and rain-fed rice flour too. I am pleased to say there are no places left for this workshop but I will be running another in late June or early July. Read about my sourdough workshops here. There are lots of permaculture design certificate courses but our Gumboot Gardeners group is helping to host something broader, deeper and more easily used for your own property. Please read about Julia and Charles’ course below, based on 25 years of teaching all over the world. Here is a little video I made about 10 years ago, of how to easily dig in green manure. For some reason it is not playing as clearly as it used to! Check out the dry stone wall in the first few seconds. I built that, with stone from my yard when we were making terraces. I had to raid a roadside cutting to get a few bits to finish it off. It is a tricky, twisted circle, going above then below where I am standing, as it was on a massive slope!